The blanket stitch is an embroidery stitch that is both decorative and functional when used along the edges of an applique. Use 3 or 6 strands of floss, depending on how dark you want the line to be. Thread the needle and knot it at one end using a quilter’s knot. To make a quilter’s knot, hold the threaded needle in your left hand. Pinch the thread under your left thumb. With your right hand, wrap the end of the thread three times around the needle. Pinch the wrapped threads using your left thumb and forefinger, then gently slide them down off the needle and to the end of the thread. A knot will form at the end of the thread. Bring the needle down about 1/8” down from the place where you brought the needle up, and about 1/8” in from the edge of the applique. Bring the needle up along the edge of the applique, directly across from where you came up in the applique. 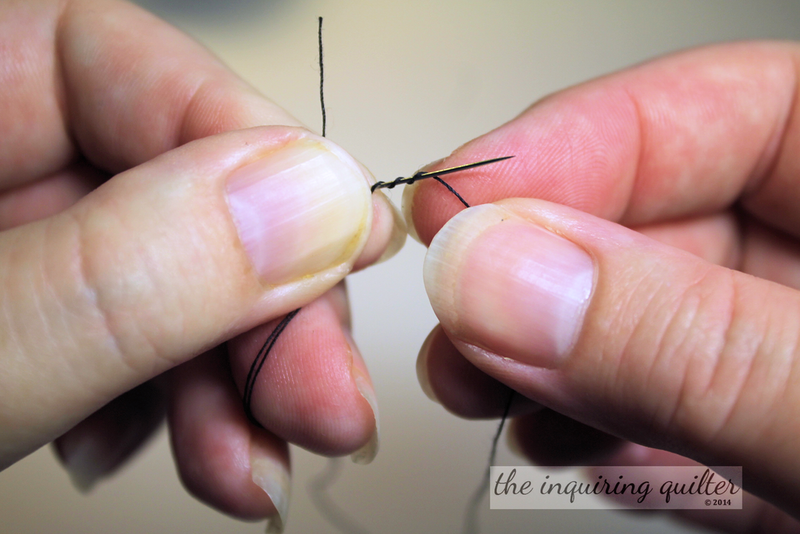 Make sure that the point of the needle is above your thread as shown. I hold my thread with my left thumb to make this part easier. Repeat steps 2 to 4 to finish the edge of your applique with blanket stitching. End your stitching by tucking your thread under a stitch on the back of your work. The stem stitch is an embroidery stitch that’s similar to the backstitch in that it can also be used to embroider a straight line. Start your stitching at the right end of the line you want to stitch. Then take a small stitch towards the left. Notice that #3 is a tiny bit back towards the right, towards #1. Bring the needle up just below your first stitch (not through the stitch, but beside it). End your stitching by tucking your thread under a stitch on the back of your work. To make an Outline stitch rather than a Stem Stitch, you follow the same steps but keep the thread above the stitching line.